Maxtor extended the Atlas 10K series with the fourth line of SCSI drives and released the first line of the Atlas 15K series. The drives of this series have the spindle speed of 15,000 rpm. They are not entirely new solutions, but it's still worth testing their performance. 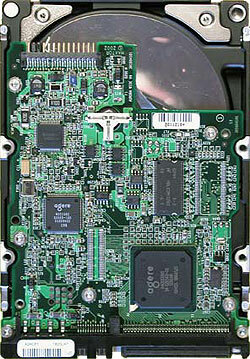 We will compare them with Seagate's models of the latest generation. 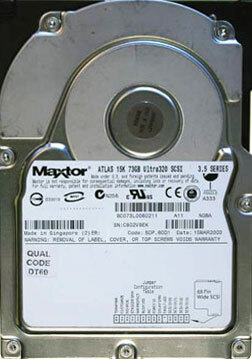 This model belongs to the fourth generation of Maxtor 10K drives. This line contains drives of 36.7, 73.5, 146.1GB with two interface types: 68-pin Wide or 80-pin SCA-2. We tested the 73.5GB disc judging by the letters in the model name. The interface is 68-pin Wide, letter L (SCA-2 interface is indicated with letter J). The company says that the data rate is increased by 24% and the average access time is decreased by 5% relative to the previous generation of SCSI 10K drives. The drive integrates the Shock Protection System, second-generation Ultra320 interface with MaxAdapt technology, an analog of Adaptive Active Filtration which reduces probability of errors, simplifies integration and increases bus efficiency. 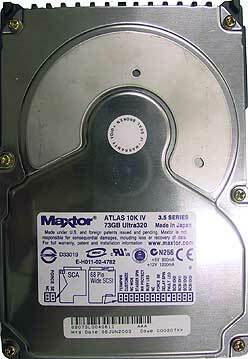 In the first lines of the technical documentation Maxtor says that Atlas 15K is The World's Fastest Hard Disk Drive. By that they mean that the average access time is 3.2 ms. The high-end model has a bit greater access time of 3.4 ms (similar to top models in lines of other companies). As compared to 10K models, the number of I/O operations per second increased by 45%. The drive also features the MaxAdapt and Shock Protection System. 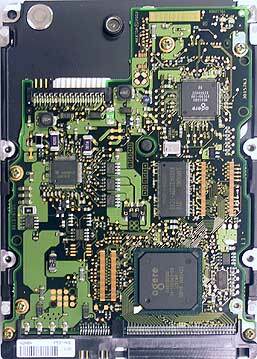 The Atlas 15K line includes 18.4, 36.7 and 73.4GB drives, with 68-pin Wide or 80-pin SCA-2 interfaces. We tested the top drive from this line with the 68-pin Wide interface. SCSI adapter - Adaptec 39320D (BIOS ver. 4.00.0, driver ver. 2.0.0.0) installed into the fifth PCI slot (first PCI64 slot). Both Maxtor models have better minimal read speed than Seagate's solutions. It corresponds to the linear reading diagrams below. Maxtor's average read speed results are understated by the HDTach test. The drives seem to have the same average write speed in each class, but are the results correct? Aren't they over- or understated? The Maxtor Atlas 10K has the obvious advantage in the access time, the 15K model doesn't match its name of The World's Fastest Hard Disk Drive (as Maxtor explains it). The results obtained by all the drives except Maxtor Atlas 15K in the HDTach Random Access Time Benchmark are almost identical to the specs. The 15K model from Maxtor has 5.9 ms instead of 2.0 + 3.4 = 5.4 ms. In Ziff-Davis WinMarks Maxtor outscores Seagate, especially in FAT32. Here Maxtor Atlas 15K looks the fastest so far. Let's see whether the scores will be proved in further tests; both Maxtors look good so far. All the tests were conducted at the default parameters of the controller driver (earlier in the other tests the performance was measured for different values of parameter HKEY_LOCAL_MACHINE\System\CurrentControlSet\Services\adpu320\Parameters\ Device\DriveParameter, see the details here). All 5 patterns equally estimate performance of the drives tested. 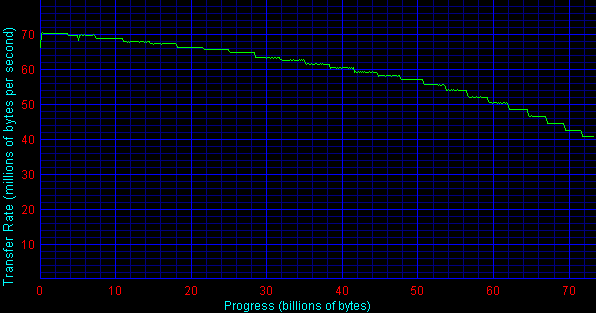 Two 10K drives show almost equal performance at low loads, while at the higher ones the Seagate takes the lead. The situation is more complicated with the 15K - the performance of the Maxtor Atlas 15K looks like the arithmetic mean value of the performance of both Seagate's drives. The picture gets more complicated at random writing. It's not easy for the new Matrox Atlas 15K to beat the Seagate 10K - it succeeds only at heavy loads. Maxtor performs better at writing, especially at heavy loads - the 15K Maxtor goes on a par with the 10K Seagate. 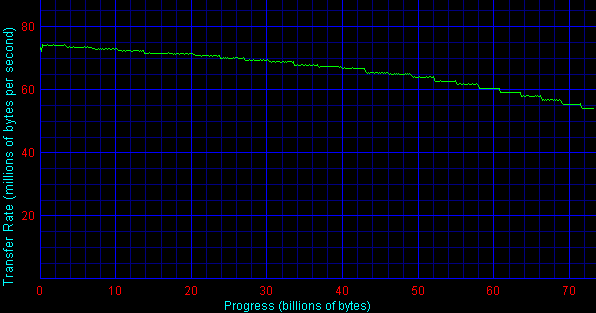 It's curious that in High-End Disk Winmark under FAT32 the 10K from Maxtor is equal to Seagate's 15K model :). In case of small data blocks the Maxtors reach the maximum performance faster; well, at least one synthetic test is not lost! 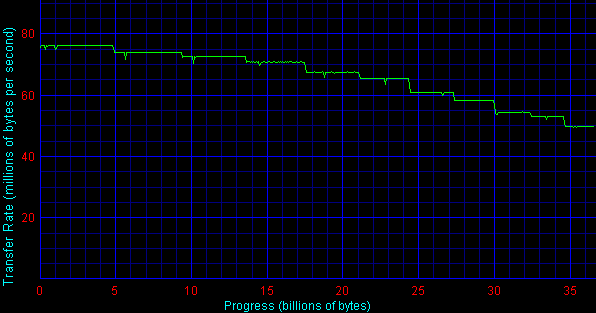 Here the situation is not that great for Maxtor - although the maximum write speed is higher compared to Seagate, it's not that quickly reached. It seems that such underperformance of Maxtor's drives in the synthetic Intel IOMeter is on account of the firmware, because they look very good in the low-level tests, for example, for access time and linear read/write speed. On the other hand, in the tests based on real applications the Maxtors work well again. 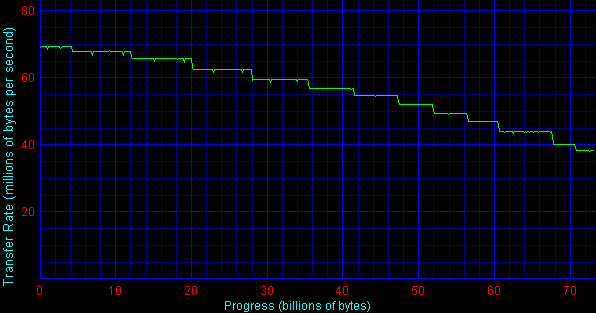 I must say that today different benchmarks often award first positions to different drives. The situation is not that good. Well, maximum loads are not reached in the Ziff-Davis, but the Maxtor Atlas 15K beats the Seagate Cheetah 15K in no patterns of the IOMeter even at the linear load!